Combining crochet and knitting with sophisticated dimension, Julia is effortlessly stylish and feminine. 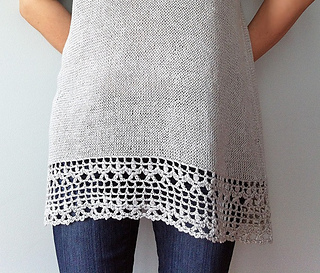 The beautiful crocheted floral lace brings eye-catching details to the yoke, sleeves and hem. Knitted top-down directly from the lace yoke in the round, the Stockinette stitch body with its gentle A-line is simple to make and flattering to wear. The unique seamless construction creates a moderate high-low hemline that further adds a chic modern twist to this exquisite piece.